Rabiah & Nassar Group, a leading diversified Saudi company, has emerged as a name to reckon with in the construction and equipment sectors of the kingdom. The diversified conglomerate has carved a niche in several fields, and through one of its subsidiaries, is among the first choices for the supply of some of the biggest global brands of construction machinery in Saudi Arabia. 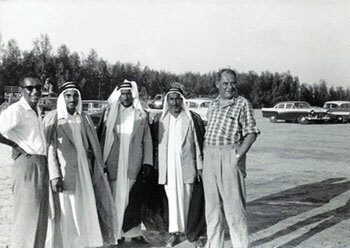 Established in 1950 in Saudi Arabia’s eastern port city of Khobar, the group started as a small road-building contractor and worked in tandem with the Arabian American Oil Company (Aramco) and municipalities to construct some of the major road networks in the kingdom’s Eastern Province. From these humble beginnings, Rabiah & Nassar Group expanded to partner with the Saudi Ministry of Communication to build the first road network in the Qassim area as well as a number of other major projects, such as airports, water treatment facilities, bridges and other road networks. The group’s continuous growth led to the widening of its theatre of action and eventually to its transfer to Riyadh, Saudi Arabia’s capital and largest city. The company continued its diversification after the transfer, branching out into engineering and contracting, real estate, agriculture, mining, commercial trading, industrial and other investments. Today, Rabiah & Nassar Group is one of the leading business groups in Saudi Arabia and contributes to the economic growth of the country. When it comes to the construction machinery sector in Saudi Arabia, the group’s subsidiary, Rabiah & Nassar Commercial (RANCO), is one of the best known and most trust-inspiring names. One of the most important pillars of the group, it was introduced in the Eastern Region in 2013 and is a rapidly growing division that specialises in the managing, commercial trading, servicing and rental operations of construction equipment as well as material handling and mobility equipment. Among the many exclusive achievements that RANCO has, RANCO is the sole dealer for the Chinese giant ZOOMLION’s rough terrain (RT) cranes and crawler cranes in Saudi Arabia, a market that has more than 50 per cent share in the Middle East’s construction machinery sector and is one of the biggest users of RT Cranes. RANCO has invested over $10 million for expansion, which includes opening of new facilities and for expanding its work force, as well as implementing new sales strategies and methodologies. As exclusive dealers for ZOOMLION RT Cranes, a leading manufacturer of construction and material handling equipment, the company has not only established its operational base in Khobar but has also branched out in Riyadh and Jeddah to serve the entire Saudi market. The ties between ZOOMLION and RANCO go back a long way. The Chinese giant entered the Saudi Arabian market in 2002 with its first crane, and has since exported more than 1,000 units of equipment, including more than 600 units of cranes, to the kingdom. Realising the potential of the Saudi market early, the Chinese giant has always placed great emphasis on the kingdom and on its partnerships there. 'We are glad that we have had remarkable performance after the years of efforts in Saudi Arabia. Our products are widely used in the fields of oil exploration, refineries, highway, railway, housing construction, etc. We are co-operating with key market players in the construction sector, such as the Saudi Bin Ladin Goup, Nesma, Al-Mabani, Azmeel, Al-Muhaidib, Al Fouzan, Shibh Al Jazira, Saudi Lebanese Tarouk, Al-Ahmed Cranes, Zamil Offshore, Gulf Haulage Rig Move, China Harbour Engineering Arabia, Expertise Contracting Co, Azmeel Cont Co, Arabian Drilling Co (ADC), OFSAT Arabia Rig Move, ACDC Co, Delama Co, PEWAT Co and others,' says Faisal Al-Mobayedh, the brand manager of RANCO. ZOOMLION and RANCO plan to focus on the correct products that have suitable applications in the market, to build a comprehensive 'product support division' which includes building a spare parts service eco-system and to promote the duos comprehensive competitiveness with the help of IT systems. 'The equipment we sell is of particular importance to the oil and gas, construction and marine sectors,' says Fahad Al Rabiah, marketing and deputy commercial manager, RANCO. 'We represent ZOOMLION’s entire RTC range and we have also included their crawler cranes and knuckle telescopic cranes in our portfolio, which enables us to offer complementary lifting solutions to our customers. And with industry-leading brands in its portfolio, as well as a culture of strategic application of leadership values such as trust, speed to market and high levels of customer service, RANCO is a group that is poised to achieve its goals.